A collision repair-related bill amended last week by the Indiana House Insurance Committee into a disaster for consumers and collision repairers but a win for insurers passed the House on Tuesday, 84-12. “We want to help consumers,” he said, noting that consumers were the point of the bill. Despite acknowledging the concerns in our interview, Carbaugh voted in support of the measure later that day. The House committee’s amendment further cut restrictions on insurers — a list already trimmed as SB 164 went through the Senate — to a single item formally creating an Indiana shop choice law. Restrictions on auto body shops remained and even expanded under the amendment passed 12-0 by the House committee on Feb. 21. Consumers also lose rights under the amended SB 164. In addition to indirectly relinquishing their right to assign policy benefits to shops (the House’s SB 164 makes it illegal for shops to accept an AOB), Indianans would be stripped of their ability to file a class-action “deceptive act” lawsuit against a body shop. State motorists and quality, well-equipped body shops also lose big under the amended law declaring both OEM repair procedures and “generally accepted industry standards” to be rebuttable presumptions that a repair wasn’t defective. Indianans would now face the burden of proof under a revised “deceptive act” law to protest that a car fixed with “industry standards” instead of the actual automaker’s repair instructions hadn’t been restored properly. An insurance industry lobbyist who presented the amendment Feb. 21 even suggested that a vehicle whose technology had changed could continue to be fixed just as it always had been by the industry. A more palatable (and Indiana Auto Body Association-supported) SB 164 passed the Senate in January. House approval of an amended version of that bill would demand the House and Senate agree upon a final version to send to Republican Gov. Eric Holcomb. Carbaugh said issues with the amended version could be worked out during those talks. “It’s always something we can deal with in conference committee,” he said. IABA President Doug Martin (Martin’s Body Shop) said Senate Majority Whip Mark Messmer, R-Jasper, who sponsored the bill to help a constituent body shop owner, has told him that if the bill couldn’t be amended into something more palatable, he would let it die in the Senate. However, Zarich is not an elected official, and it was unclear from the Legislature’s website which lawmaker was responsible for formally introducing the language. Carbaugh said it was attributed to him as the committee head, but he seemed to suggest that this was different than authorship. 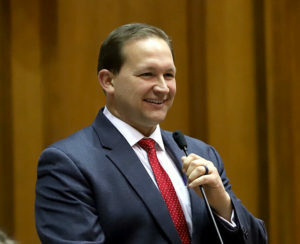 Asked about a fellow committee member who mentioned not having a copy of the amendment he was about to vote upon last week, Carbaugh said the document was available publicly online two hours before the committee meeting, per Indiana law. He said it’s typical that such items aren’t available until the day of a hearing.